Think about a young couple – starting out with all the odds stacked against them. 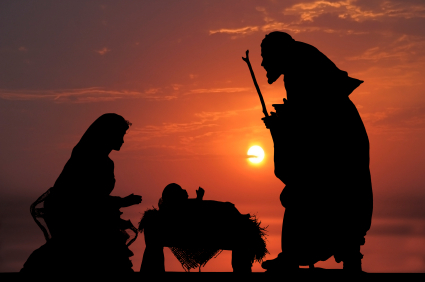 Think about field workers (shepherds) out doing their jobs and then seeing something unbelievable – I mean, how many people today would put any stock in a group of common laborers that said they had seen angels in the sky singing and talking about a baby that will be king of the world. And then you have a community in general, that has not heard from God in 400 years, trying to figure out what to make of these experiences and if God really is doing something. How many of us go through dry spells in our experience with God and then question the thoughts, words, and experiences that God brings to us??? It is so easy to get busy, be busy and stay busy during this season. In fact, in some ways, it almost seems as if we are supposed to be in this state busyness. We have the things we need to do. We have the things we want to do. And then you add in all of the things that everyone else wants us to do or to participate in. It can be quite overwhelming and can cause us to begin shutting down – and we then find ourselves just going through the motions. We can become so distracted and stressed by trying to do all of the right things, that we eventually squeeze out the most important things (like a real connection with God and family). I encourage you to make an appointment with God each day between now and Christmas. Decide to take a specific amount of time at a specific time each day just to be with God, to meditate on His Word and the stories of this season. Even in this busy time of year, God is still God. We are still a part of His story. And we can still have joy because God really does love us!